DEMOS - Home > News > “PRISMA PASING” in Munich-Pasing. Today marks the development’s official sales launch! Construction is currently underway on a new and diverse city district in Munich’s Paul-Gerhardt-Allee, located in the popular borough of Pasing-Obermenzing. And in the east of this new district, DEMOS is in the process of completing its latest project, “PRISMA PASING”. Sales of the housing complex’s modern 1- to 4-room condominiums begin today. Situated in close proximity to Nymphenburger Schlosspark, “PRISMA PASING” offers a perfect mix of city and nature. The housing complex also boasts an inner courtyard featuring spacious private park gardens with lovingly landscaped green areas, paths, open spaces and playgrounds. Adjoining the complex at its southern and eastern sides is a newly created landscaped park. 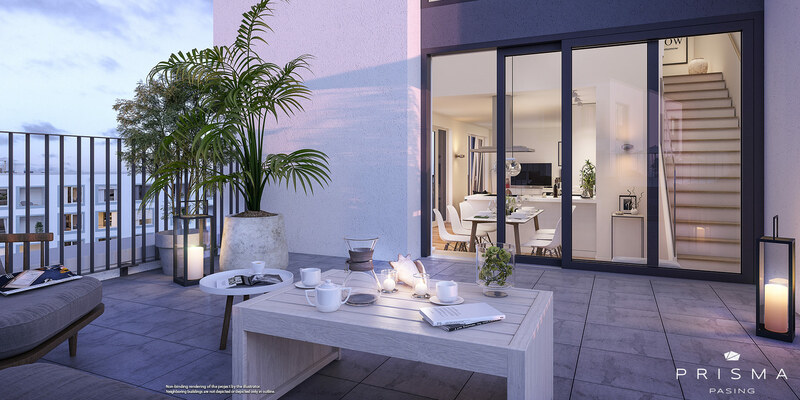 Whether you are looking for a compact property for capital investment purposes or a spacious family apartment, “PRISMA PASING” will have something to suit your needs. Its multifaceted condominiums range in size from around 29 m2 to around 105 m2 and are designed to accommodate diverse concepts and life plans. The condominiums have a patio, loggia or rooftop patio and all feature high-quality equipment and furnishings, including real wood parquet flooring, underfloor heating, modern bathrooms (most of them with floor-level showers) and electric external shutters. For detailed information about “PRISMA PASING”, click here or visit our Information Center – on site, where our sales team will be more than happy to assist you.